Time Machine in macOS can work within a number of apps, letting you retrieve older versions of files or even deleted email messages in the Mail app. However, if an entire folder of stuff goes away, you need to turn to the Finder. Macworld reader Harold found himself in this pinch, because a folder that contains all his business emails disappeared from Mail without any action on his part that he’s aware of. He first tried to use Time Machine within Mail, opening Mail, then choosing Enter Time Machine from the Time Machine system menu item. Every time he did so, Mail quit! If you’re using IMAP, a protocol for syncing messages with a remote server to a local app’s mailbox, it’s possible to recover it that way, assuming the deletion didn’t propagate to the server, too. You should be able to select in Mail: Mailbox > Synchronize > Mail account name, and this will restore access to the messages. Failing that, however, Time Machine can still do the trick, because it’s backing up the mailbox files that Mail uses to store messages locally. 1. In the Finder, choose Enter Time Machine from the Time Machine system menu item. 2. Go to your Home directory, then open the Library folder, then the Mail folder inside that. 3. You may see multiple folders at the next level. Look for the one starting with V that has the most recent modification date and open it. 4. You’ll see several folder with long hexadecimal (base 16) names. One of these is the folder that corresponds to the mail account that has the mailbox you need in it. Open each in turn until you find the right one. 5. Restore the file with the name of the missing mailbox, like Small House Design.mbox to the Desktop or somewhere, not to the original location. 7. Switch to Mail, and then choose File > Import Mailboxes. An imported mailbox has a nested hierarchy of folders that you can just ignore. 9. Select the mbox file in at this stage and click Choose. 10. All the messages under Items To Import will be selected by default, and that’s likely what you want to keep in place. 12. 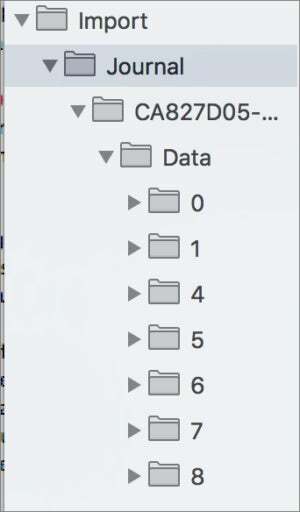 You’ll see a dialog that the messages are in a folder and it tells you the name, which is typical “Import” unless that folder already exists. 13. Look in the Mailboxes view at left under On My Mac, and the Import folder should be at the bottom. Select it. 15. Re-create the mailbox that was deleted. 16. From the Import mailbox, select all the messages and drag them into the mailbox you want them back in. If that mailbox is hosted on an IMAP server, Mail will upload them there.